Convert your word, excel, or powerpoint files to PDF! 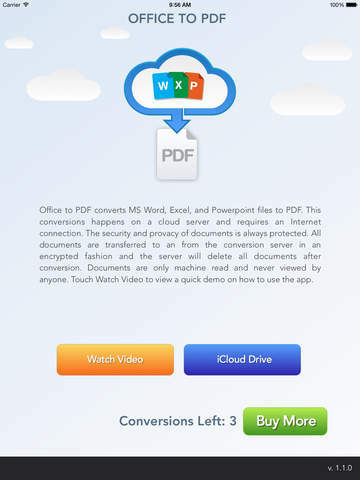 Office To PDF is a universal iOS app for both iPhone and iPad that will convert your existing MS Office files to PDF. 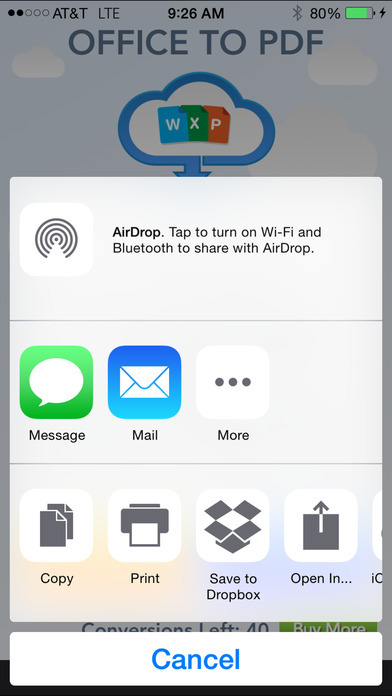 After conversion, files can be viewed, printed, emailed, stored in iCloud, or sent to any other app that accepts PDFs. 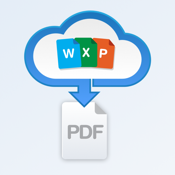 - Accepts multiple file formats including .doc, .docx, .xls, .xlsx, .ppt, and .pptx. - Just touch and hold down on a file attachment from mail and select Open In Office To PDF to start conversion. - Can accept MS Office files from any other app that can send them such as DropBox. - Export completed PDFs multiple ways including email, iCloud Drive, and sending to another app for annotation such as Sign-N-Send. - App includes free conversion of 3 documents. Additional conversions can be obtained using in-app purchase.